Don’t listen to our opinion pieces about how beautiful the shrubs were in Firewatch, or praising Undertale’s lovely, cuddly combat alternatives – we’re full of it. When no-one’s looking, we’re committing wanton acts of virtual savagery with the best of them, slapping people and weeing in water supplies at the merest suggestion the game might allow it. Looking to put all this behind you and make some new memories? Build a better tomorrow with the best sandbox games on PC. And the thing is, you can never quite square away those lapses into polygonal psychopathy once you’ve committed them, can you? They re-emerge as flashbacks many years later to call into question your moral fibre. You might call yourself a decent, upstanding person, say the voices, but we haven’t forgotten… the swimming pool incident. I remind myself that it’s only a game, but still, that’s a hell of an admission. I knew very early on that I couldn’t actually kill the kid. He was unconscious and bloodied, yet inevitably he’d stand back up and resume his attempted escape. 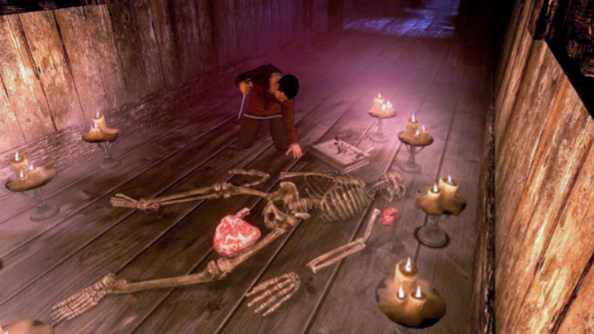 Whether it was because I didn’t want him to make it out into the streets and alert the rest of Windhelm to my crime or if I had just become distracted by what was at face value an amusing response to the emotional situation before me, I’ll never know. Regardless, it was the greatest moral failing of my life. Batting the young Aventus into a corner over and over again, watching him go limp and then suddenly reanimate became almost hypnotic; astoundingly cruel upon reflection, but hypnotic no less. At least – and I reiterate this every night before crying myself to sleep – I never actually killed the boy. Sure, for an hour all Aventus knew was fear and pain at the end of a Daedric warhammer, but at least I didn’t kill him. Boredom, rage, a sudden sensation of power: something came over me in that moment (and each subsequent moment lasting roughly an hour) that I could not control. I can never undo the trauma I caused Aventus, and for that I am eternally sorry. 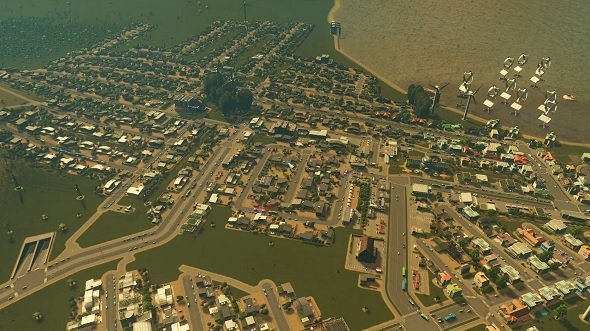 Look, everything I did to my citizens in Cities: Skylines was done in the name of science. I was just doing my job. In the pursuit of knowledge, sacrifices have to be made. Do you think I liked pouring sewage into the water supply, poisoning an entire city? Of course I didn’t. I certainly didn’t laugh at the prospect of them drinking poo-water. And I didn’t let out a single cackle when I subsequently flooded the entire commercial district. When I built another city, a winter wonderland, and then turned off the heat, watching as tens of thousands of people froze to death in their homes, you might think that a pattern was emerging. But you’d be wrong, guys. Seriously. I need to reiterate: I was just doing my job. I felt bad, I really did. But what choice did I have? Someone was going to do it. If anything, I took one for the team. I stay awake at night now, wondering what horrors I’ll have to unleash on my citizens when the next expansion arrives. A demonic invasion? A volcanic eruption? A fight club for children? It’s ok, I tell myself. Soon I won’t have a soul, and I won’t mind so much. Like every morally questionable decision I make in life, I’m putting it down to existential malaise. Mainly as I don’t know how else to mitigate it. 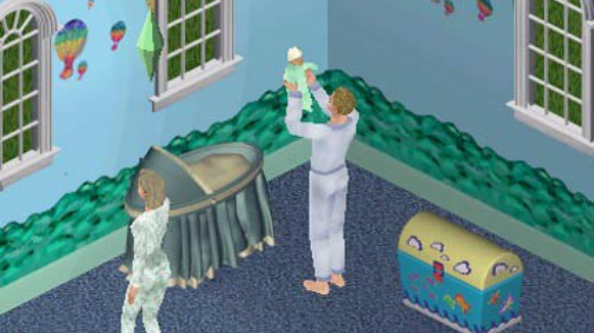 I fell into the original Sims hard; it wasn’t just my on-screen avatar whose bladder meter was in danger of maxing out during the spring of 2000. And I lived a clean life. An Ikea catalogue life, full of nicely painted rooms, well ordered furniture, and neatly pressed button-down shirts. It the game had a bar for ‘wholesomeness’, it would’ve burst. But such a serene life can only maintain us for so long. As Woody Allen once said, “You can live to be a hundred if you give up all the things that make you want to live to be a hundred.” Very much the #yolo of its day, that. So as time wore on, virtual Joel got bored. The wife, the picket fence, the well-paid 9-to-5, the communicating via indecipherable gibberish. You know how it is. We thought a child might snap us out of our midlife funk, but alas, this ennui was hard to shift. And so it came to pass. While the cat’s away, the mouse will build an extension in the garden, line the wall with ovens, place the crib in the centre, and then block up the door. It’s not one you’ll read in Cosmo any time soon, but life sure wasn’t dull for long after that. An awful lot of games make murderers of us, in a South Park coming-right-for-us sense. Usually the murdered party attacks first, or at least sports a handy red health bar, and that feels like justification. 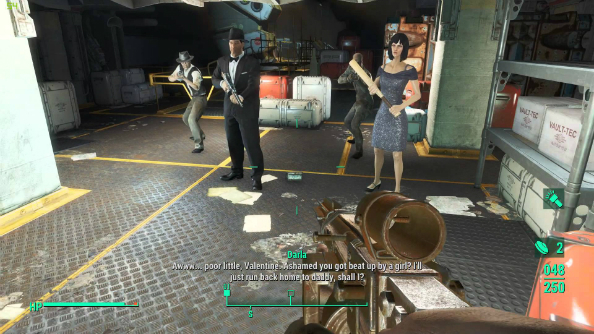 But there’s something different about exploiting a game’s systems to premeditate the killing an otherwise friendly NPC. It sticks in the mind. In the cemetery of Cyseal, Divinity: Original Sin’s seaside city, I met Eglandaer. After a terrible trauma, this elf was driven to hunt down every last member of the marauding orc tribe that had killed his family. Trouble was: I happened to know the last orc in that tribe – adopted by Cyseal’s mayor, now its librarian – and she was perfectly lovely. Concerns dismissed by the commander of the guard, I put a plan into action – tracing Eglandaer back to the second floor of the King Crab Inn, where he’d found temporary residence. 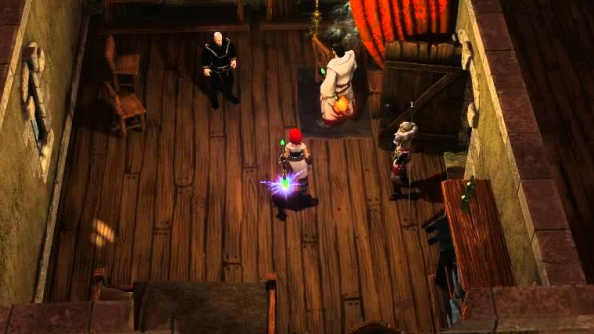 Divinity, nothing if not co-op ready, allows you to split up party members across wide areas. I had one watch the tavern stairs, a second engage our mark in conversation, and a third sneak around his back with a big knife. The initial backstab didn’t quite do for him, and it took a messy few seconds of turn-based resolution before he lay on the boards as a bundle of inventory items. No consequences ensued. No witnesses, since the doors were closed. The simulation allowed for it. And yet: playing RPGs since, I’ve sometimes stopped to wonder whether I’m ever really making a fantasy world a better place so much as subtracting the bad things from it, leaving only silence. It’s the time it took that stays with me. I had so many opportunities to pause and reflect on what I was doing, then decide not to continue doing it. Instead I persevered. The leg goes here, I must have said to myself, and the head on top of there. It wasn’t that I was so invested in the plot that I boiled over into a feral rage. Or that somehow, medium-time mobster Skinny Malone had marked himself deserving of such a grim end by my twisted logic. Honestly, I think I just wanted to know if it were possible. Of course, I did already have quite clear indication that it was possible, because I’d previously download a very specific dismemberment enhancement mod for my game, which I won’t link here, but makes its function very clear in its name. They’d have been absolutely right of course, had they existed/stumbled upon the body/been actual sentient beings capable of fairly complex deductive reasoning. And that really makes me think. I’m not normally a violent person, so I don’t typically go in for any of that psychotic gamer behavior (roasting babies? REALLY? ), but you can damn well rely on the fact that I will do everything in my power to destroy you should you cross me. And what better game for revenge than Rust, the caveman survival game. Survival games are notoriously difficult to get into, thanks to players being relentlessly awful to each other, and on this occasion I’d been struggling to stay alive longer than five minutes thanks to a pair of players who were actively spending their time tracking me down and killing me. But thanks the the joys of simulated reality, the pair of them couldn’t stay in Rust forever. At some point they’d have to log off. 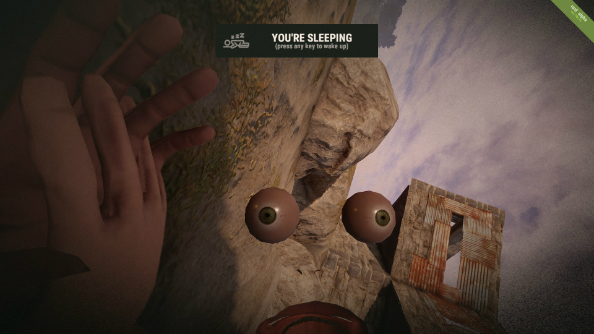 And when you log off in Rust, your character lies down and goes to sleep. I learnt how to effectively hide, and tracked the two back to their massive fortress of doom that they’d clearly spend much time and resources building. While the doors were locked and the ground floor windows barred, there was nothing stopping me getting in through the roof, aside from the fact that Rust is not Assassin’s Creed and you can’t climb. So I simply built my own steps against the side of the wall, ran up, and invaded their stronghold. Rock in hand, I proceeded to bash-in the skulls of the two sleeping bullies, and then steal all their stuff (mostly chicken). And that’s why you don’t mess with Matt Purslow. What’s the worst thing you’ve done in a game? Dare we even ask? Let us know below.